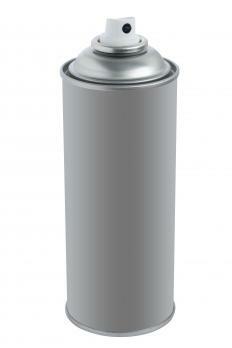 A can of presure sensitive, aerosol adhesive. Where other adhesives might require heat or some kind of solvent to effectively bind two materials together, pressure sensitive adhesives (PSAs), as the name suggests, simply require pressure. Pressure sensitive adhesive is typically made from non-crosslinked rubber adhesives, polyurethanes, and acrylics. Although a pressure sensitive adhesive can form a strong bond, it can also be easily peeled off without damaging the surface. PSAs can firmly adhere to almost all types of surfaces such as wood, paper, and plastic. Tape, labels, and post-it notes are products that use PSAs. There are basically three types of PSA products: hot melt PSAs, PSA glues, and PSA tapes. Hot melt PSAs can be molded into different shapes, and they can also form a thick and tacky substance. These adhesives are mainly used for metal working, wood and plastic sculpting, and automobile repairs. A machine or a glue gun is used to heat the adhesive till it becomes thick and sticky, which is then applied onto the surface. PSA glues are typically more runny than hot melt adhesives. They set quickly, however, and dry almost instantly. Available in both aerosol and liquid forms, they can be applied directly onto the surface without any additional preparation like heating. PSA glues are commonly used in electronic, industrial and medical fields. A PSA tape is a thin self-stick tape that is usually used to bind two flat surfaces together, such as two thin, wooden panels. PSA tapes usually coat a material such as silicon, fabric, or metal with the adhesive. One of the benefits of these adhesive tapes is that they can withstand friction and temperature changes. Pressure sensitive adhesives come in a variety of different chemical compositions. Most commonly, they are made from rubber-based or acrylic adhesives, which are generally used for household purposes. Natural resins and synthetic rubber-based adhesives consist of organic compounds, such as chloroprene, polybutadiene, neoprene, and silicone. Most types of pressure sensitive adhesive “cure” very quickly. As a result, applying a product with a PSA should be done with care. Other, "peelable" types of pressure sensitive adhesive allow for easy repositioning, however. Good quality PSAs, whether the peelable or non-peelable type, will not leave a visible layer of glue on the surface once it is removed or repositioned. How Do I Choose the Best Metal Adhesive? What Is a Hot-Melt Adhesive? What are the Different Types of Rubber Adhesive? What are the Different Types of Plastic Adhesive?